So I was working on the new HP BYOD Solution in my lab and I just didn’t have enough wireless devices to really make it interesting. So I decided to look for other devices in my house which I could connect to the HPN BYOD Controlled MSM controller-based wireless networks. Anyways, the great thing about HP’s new BYOD solution, based on IMC and UAM, is the ability for operators to extend the default fingerprints to devices beyond what was shipped with the product. Although the process does require some knowledge of wireshark, it’s nothing that a little google-technician skills can’t get you through. The adding of fingerprints was super easy. So let’s look at what the process looks like. IMC ships with a bunch of endpoint types by default to cover all the normal devices you would see in a business environment. I don’t see that many Wii’s in offices these days though, so we’ll have to create this one too. Again, No love for Nintendo in the OS department. Let’s add that too. DHCP Fingerprint – In this option IMC uses the options requested in the DHCP client option 55 field to identify the device requesting an address. The specific sequence and number of options are considered to be unique to that specific operating system. ie. All Nintendo Wii machines should request the same values in the same order in the option 55 field of the DHCP request packet. This is considered to be the most reliable of the fingerprinting techniques. HTTP User-Agent – In this option IMC uses the User-agent portion of the HTTP request headers sent to the BYOD web server to be able to identify the device requesting the webpage. As most browsers will identify themselves through the use of HTTP User-Agent, this is a still a good method for making an educated decision. MAC Address – In this option IMC uses the MAC address, obtained through the RADIUS server, to identify the vendor based on the MAC address OUI. This is considered to be the weakest form of fingerprinting, but necessary as some devices do not use a unique DHCP signature, nor a web browser. An example of this might be an IP Telephone or Printer. So let’s get started here and setup our first fingerprint. This is where the nerdiness starts. I have a Windows Active Directory Server that is serving up addresses for the network that my Wii connects to. So I just installed wireshark on the domain controller and start capturing packets. note: I use the filter bootp.option.type == 53 which will get allow me to see just the DHCP traffic. Cuts down on the packets I need to look through. You can see in the packet capture above that the option 55 parameters list has a length of 6, and the values are 1,3,6,15,28, and 33. Now that we’ve got the DHCP Fingerprint, let’s go after the HTTP Fingerprint. This time, I”m running a packet trace from wireshark loaded on my IMC machine ( this is handy for a whole bunch of reasons) I use the Internet Channel on my Wii and attempt to login to the IMC server. 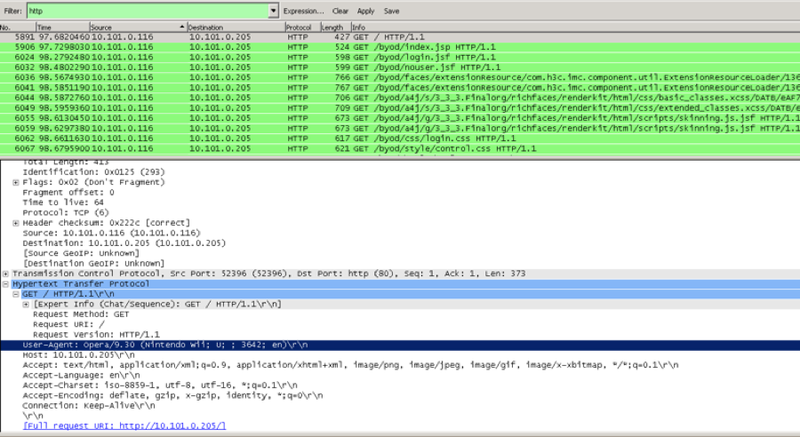 Now I check Wireshark again, this time using HTTP as the filter. I could also add the filter for the specific host 10.101.0.116, but in this case it’s just as easy to resort by the source server and get to the right packet. There it is… “Nintendo Wii”. Now that I’ve got the HTTP User Agent Signature, I can now go back to IMC and add that in as well. So, we created the DHCP Character Identification as well as the HTTP User Agent Feature Identification. Now we’re going to connect the wii to the BYOD-enabled wireless network and see what the test this out and see what our work has gotten us. Fingerprinting Successful. 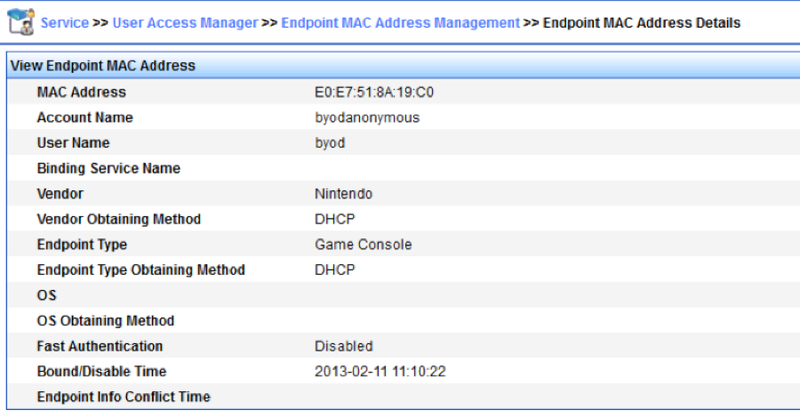 As you can see, the Nintendo Wii was identified by the DHCP client identifier and has been successfully registered in the endpoint MAC address management list in UAM. The one step other step which I did skip here was adding a MAC address finger print to identify devices which would allow you to identify the device by it’s MAC address. To be honest, that doesn’t require a packet trace, so I skipped that step. What fun is something that doesn’t require a packet trace?